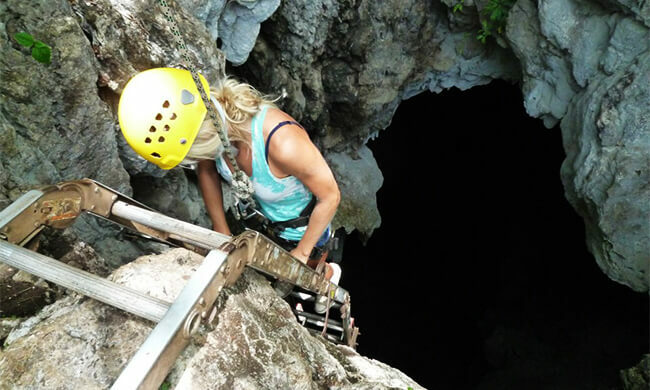 Rappell Down to Cavern Floor & Explore Ghost-like Calcium Formations! Arrive at the Barra Honda National Park for a one-hour hike to the entrance to the cave. Keep an eye out for coatis, agoutis, anteaters, and monkeys. Your adventure continues as you rappel to the cavern floor to begin your spelunking. You’ll be amazed by stalactites and stalagmites, ghost-like formations of hardened calcium, and rock creations of all shapes and sizes. In total there are 42 different caves in Barra Honda, but only one is open to visitors. You’ll spend an hour exploring the cave before returning above ground for lunch. This tour requires good physical condition. The hiking and the cave exploring are between an intermediate to hard physical impact level. It is not recommended for anyone with claustrophobia or fear of the dark. You must be at least eight years old to participate. Tour includes: Transportation from/to your hotel, bilingual guide, safety helmet, flash light, lunch, bottled water, juice. What to bring: Sturdy hiking shoes, sneakers, or trail shoes (no sandals or flip flops), light comfortable clothing (pants or long shorts), binoculars, camera, sun hat, sunscreen, insect repellent.